A group of geologists is contesting the idea that the landing location of the Mars rover Opportunity is the site of an evaporated lake, a debate that will not dry up anytime soon. Geologists say that the Burns cliff feature on Mars (left), near the rover Opportunity's landing site, looks remarkably similar to volcanic eruption deposits like those at Kilbourne Hole in southern New Mexico (right). New research is suggesting that what was once considered a watery landing site may instead be remnants of an impact. Image (left) courtesy NASA/JPL and (right) Paul Knauth. 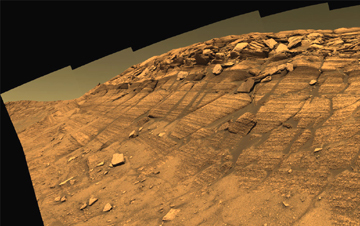 NASA's Mars Exploration Rover team has suggested that water was once present at Opportunity's landing site, Meridiani Planum, and that it can account for the geologic features and chemistry found there. But Paul Knauth, a geologist at Arizona State University in Tempe, and colleagues put forth a different interpretation of Mars rover data in their Dec. 22 paper in Nature. They say that a more simple explanation for features observed at Meridiani is that the region was struck by an enormous meteorite impact. When Knauth and colleagues saw the images from the rover landing site, they immediately recognized the features' similarity to impact craters observed on Earth. After a large explosion or impact, a cloud of debris spreads out and deposits layers in what is called a "base surge." Images taken by Opportunity as it further explored the landing site showed what "looked exactly like a base surge," Knauth says. But the real kicker for the team was when the rover sent back its chemistry analyses. 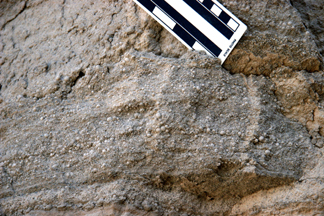 If the site was a lakebed, then when the water evaporated, salts would have precipitated out into distinct layers. "But that doesn't happen there," Knauth says. Instead, the salts are "all mixed up," with the most soluble and least soluble together. A base surge from an impact, however, would account for the mixing, Knauth says. Also, the presence of what the Mars rover team calls blueberries, or small round nodules found in place at the site, support the impact hypothesis, Knauth says. Features similar to the blueberries have been found on Earth around volcanoes and impact craters such as Meteor Crater in Arizona. The iron content found in the blueberries could also be explained by an impact from an iron meteorite. Features found at a volcanic crater, Kilbourne Hole in New Mexico, appear similar in size and shape to the martian "blueberries." Geologists say that Earths blueberries can form from both volcanic and meteorite impacts. Image courtesy of Paul Knauth. But Steve Squyres of the Mars Exploration Rover team stands by the hypothesis that water accounts for the features at Meridiani. Researchers have previously published evidence for similar sedimentary processes that formed blueberries on Earth. The fundamental problem with this paper, Squyres says, is that the researchers "are behind the times." He says that Knauth and colleagues did not have all of the data available from the rovers when they published their paper. Knauth says, however, that the Mars exploration team was "wrong when they say we were unaware of their latest results," citing the fact that they follow the images daily and that the latest results actually bolster the impact interpretation. 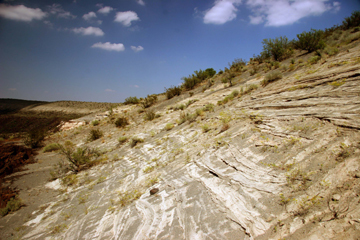 When looking at 3.5-billion-year-old strata, however, Knauth says that it's difficult to know exactly what happened. "It's very interpretive, so what you try to do is come up with multiple hypotheses and then rank them according to simplicity," Knauth says. "We've done that, and we put our money on the impact surge as the easiest hypothesis." In the same issue of Nature, another team of researchers suggests that volcanic activity could also account for the evidence of a lake on Mars  and so the debate continues.